After the loss of Brisach beyond the Rhine in 1697, the construction of a new stronghold on the Alsace plain was called for. Vauban was sent in haste to the site. He submitted different projects to the king, who chose the most complete and expensive one. Construction started in 1699 and involved digging a canal right to the Vosges to bring the pink sandstone required. After 1703, when Brisach was recaptured, work dragged on as the new stronghold had lost its strategic importance. Neuf-Brisach is the sole example of Vauban’s third system and is his most successful urban planning project. A simple principle determines the internal organization of this octagonal layout namely to provide practical internal thoroughfares so that different areas, for commanding, fighting or civilian activity could exist in harmony without getting in each others way. The town was divided into 48 blocks, set around the central parade ground which grouped together the most important buildings. 34 of the blocks were reserved for use by the 4000 inhabitants of the town. The barracks were constructed up against the ramparts to best protect the civilians. 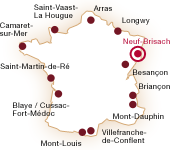 A perfect star on the Alsace plain, Neuf-Brisach can be seen as the culmination of all of Vauban’s fortified work.